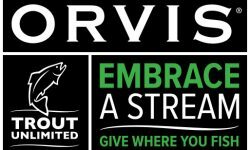 The Embrace A Stream Challenge is a week-long competition to help bring critical funding to important local Trout Unlimited chapter projects in streams and schools across the country. 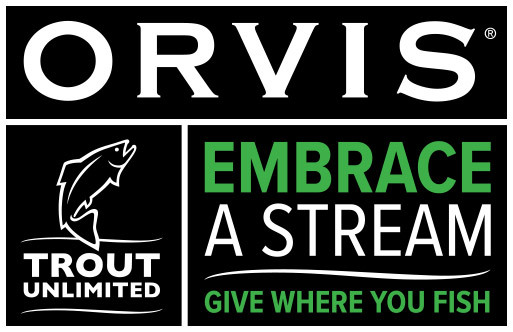 Sponsored by Trout Unlimited and Orvis, and leveraging our network of more than 400 local chapters and councils, we are challenging all of our members and supporters to “Give Where You Fish” and ensure our coldwater resources get the help they need now more than ever. Every $10 donation you make can unlock prizes up to $1,000. Every $25 donation you make can unlock prizes up to $2,500. With more than 40 great projects – and rivers – to choose from, you have the power to make an impact on a river close to home, or on a storied stream you’ve always wanted to fish. Best of all, your donation helps local chapters and local volunteers make a difference in their home waters. Since its inception in 1975, Trout Unlimited’s Embrace A Stream grant program has funded more than 1,000 projects with more than $4.4. Local TU chapters and councils contributed an additional $13 million in cash and in-kind support, bringing the impact of this program to over $17 million!